Last weekend I had a great opportunity to visit New York City on a budget. 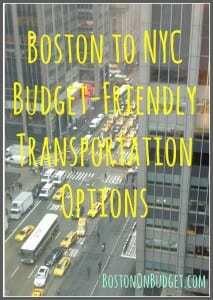 I had accommodations covered, so I only had to pay for my transportation to NYC to and from Boston and any food or entertainment costs. I had never travelled to New York City before but I knew I had four options. Honestly, I didn’t even consider flying or driving because I didn’t want to spend time waiting in the airport and I didn’t want to attempt driving in NYC. Also, after gas, tolls, and parking, driving would have been the most expensive option for me. The train was also expensive at around $200 round-trip, depending on the hour and how far in advance I booked. My trip was a little spur of the moment, so my transportation options were not as budget-friendly as it could have been if I planned ahead. For me, taking the bus was the best option. Hands down. I did a lot of research and asked for recommendations from friends. I looked at Bolt Bus, Megabus and Greyhound. Due to price and schedule, I took Megabus to NYC from Boston and on the way home I took Bolt Bus. Here’s the breakdown of my experience and my comparison of the two. Depart Boston, MA, South Station at 7:30 PM arrive New York, NY, 7th Ave & 28th St. at 11:59 PM. Left on time, and arrived a few minutes early to NYC. Cost of ticket: $22 one way + .50 booking fee. *I booked this less than hour before on my smartphone. It was a little cheaper earlier in the day, but it was a last minute decision. It would have been $40 if I bought a ticket at South Station, so please book your ticket online or on your phone! Showed ticket via e-mail confirmation on smartphone. Didn’t need printed ticket. Had power outlet above or underneath each seat; able to charge cellphone. Megabus is a double decker bus, and I sat on the bottom whereas more people sat on top. It wasn’t very crowded and I had plenty of space. (If I didn’t travel at night, I would have sat on top because I heard you get great views of the city). Arrived on time and in a safe manner. No stops, just direct to NYC! Megabus doesn’t have a terminal or station, so we were dropped off on a street corner. Did not go over safety procedures or anything when we left. We didn’t stop at a rest area, and went directly to NYC. Bathrooms were available on bus. (I didn’t use them). I don’t think my bus driver said a single word during the entire trip. Depart New York – W. 33rd St Between 11th & 12th Ave. at 9:30am to Boston South Station at 1:45pm. The bus arrived a few minutes late, and we arrived at South Station about 15 minutes late. We also stopped at Wendy’s in CT off the highway. Cost of ticket: $17 for one-way. Booked a few hours before on my computer. The ticket was inexpensive and it was easy to book online. Rates start as low $1 when booked in advance. Arrived safe and sound after one stop to Wendy’s. Bolt Bus does not have a terminal, so we were waiting on the street for the bus. It was December and it was cold. Really Cold. Bus arrived late at 9:32am, but we ended up leaving just a few minutes later. We arrived late into South Station about 15 minutes. We did stop at Wendy’s and took longer than expected. If the bus arrived on time and it didn’t take so long at Wendy’s we would have arrived on time. Only window side passengers have power supply, so keep that in mind when you pick your seat. Also, the handicap row doesn’t have a power supply either. We stopped at a Wendy’s around half-way in our trip (although there were bathrooms on the bus too) and were given 15 minutes. (It turned into 25-minutes as we waited for everyone to get there food and such). There were TV’s on the bus, but we didn’t watch a movie. Overall, I had a decent experience on each bus. Both busses do offer $1 fares and cheaper fares when booked in advance. The sooner you book your rate, the lower fare you typically receive. However, even though I booked on the same day of my trip, I still feel like I got a decent rate. I don’t think I could have driven, flown, or taken the train for $40 roundtrip. 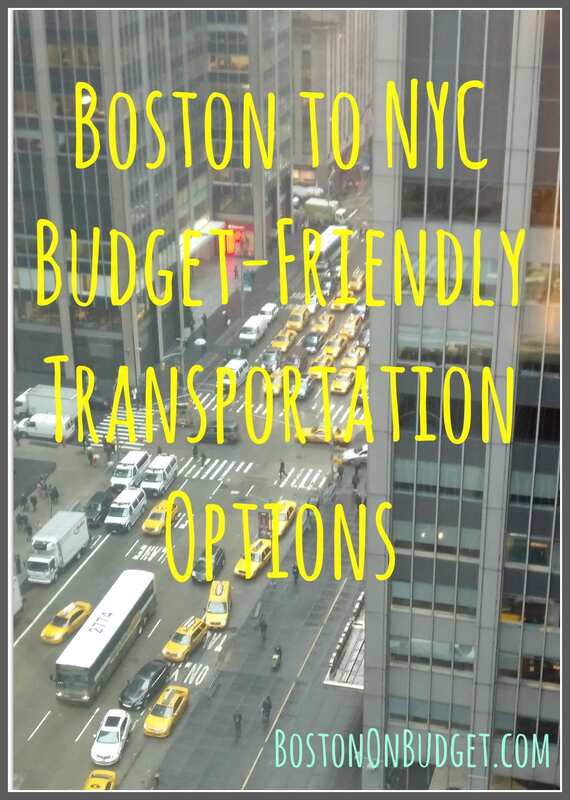 If you are looking for a budget-friendly way to go and from Boston and New York City, Bolt and Megabus is definitely a great way to go. I would definitely use both busses again and recommend both. However, I may look into another bus company too, especially if they have an indoor terminal from NYC if I’m traveling in the winter again. If you have travelled to Boston to NYC, what is your favorite way to travel? And do you have any bus recommendations that I haven’t tried or any pro tips to share? *This post contains some affiliate links, however all thoughts and opinions are my own. Please see my disclosure policy here.